The 1940s were full of hope and speculation from the automotive industry. Professionals and bystanders alike just assumed that our cars would become space-age wonders virtually overnight. It’s true that the cars of today are remarkably advanced by the standards of the 40s, but we are still waiting for most of the incredible features we thought would be commonplace by now. 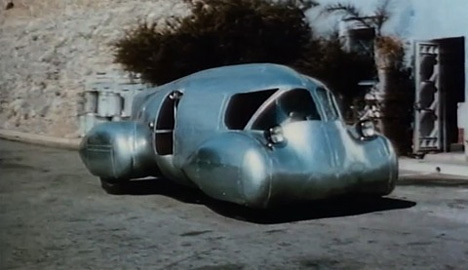 This gem of a video from 1948 shows just how hopeful we were about the future of cars. The video was produced by Popular Mechanics as part of a series showcasing future technology. It features predictions for three amazing cars of the future: the three-wheeled automobile that makes parallel parking simple, a hulking monster that looks like something The Rocketeer would drive, and an otherwise-normal looking car with moving fenders and a cockpit. We might actually prefer these designs to some of the ridiculously tiny space-age concept cars of today.